Sable Gibson, a Mason City Schools student, died from complications of the flu. 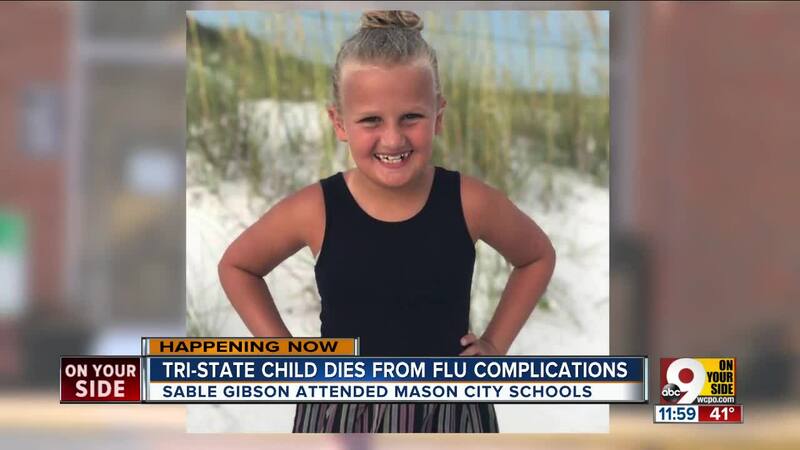 MASON, Ohio — Western Row Elementary School fourth-grader Sable Gibson died Tuesday of cardiac arrest connected to strep throat and influenza, Mason City Schools spokeswoman Tracey Carson wrote in a message to parents. Gibson received the double diagnosis early Tuesday morning and died hours later. "Because kids go to school and they're in a public environment more often and around many people," Choksy said. "They're more likely to get it." This article originally reported the date of Sable Gibson's death as Wednesday. According to family, it was Tuesday. WCPO regrets this error.